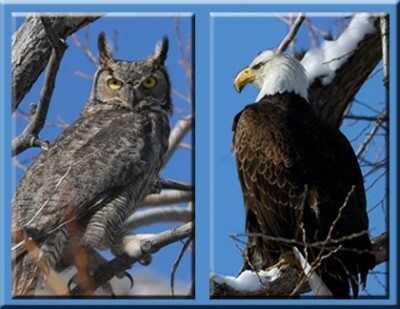 The Klamath Basin is home to the largest concentration of bald eagles in the lower 48 states. Over 100 species of birds counted each winter in this area in Oregon and California. Phenomenal birding / nature – related opportunities for all ages are yours at the Winter Wings Festival. Whether you are a beginning birder, a life-long birding enthusiast, or a photographer, you will be impressed by the rich diversity present in the Klamath Basin during wintertime. The Winter Wings Festival is produced by the Klamath Basin Audubon Society and takes place each year over Presidents’ Day Weekend. A small gathering that began as the Bald Eagle Conference over 30 years ago has now become an incredible event for bird enthusiasts of all levels. Over 500 people have registered for the festival in recent years to enjoy presentations, workshops, field trips, and free family activities. The Klamath Basin, located in southern Oregon and northern California, is a major migratory stop over in the Klamath Basin. Six national wildlife refuges covering nearly 200,000 acres attract an impressive variety of waterfowl and raptors, many in astounding numbers. Where is the Festival located? All festival activities take place in the Klamath Basin, in and around the city of Klamath Falls. Unless otherwise stated the activities take place at the OIT campus located at 3201 Campus Drive, Klamath Falls. What to wear / bring? For the field trips, bring layered clothing, a warm jacket, gloves, hat, comfortable walking shoes or boots, binoculars, camera, bird identification guide, water, and snacks. The leader may have a spotting scope; you are also welcome to bring your own. We’ll provide bird checklists at registration. What’s the weather like? Klamath Falls is known for its 300 days of sunshine per year. The average daily high temperature in February is 46 degrees. Snow is a possibility at this time of year, so be prepared. Flyouts can be particularly chilly. Where will you stay? Clients will stay at one of the festival’s host hotels, likely the Running Y Lodge, one of Southern Oregon’s premier resort destinations. Thank you for visiting! Please contact us for Winter Wings Festival 2018. We are able to offer bus transportation from Northern California, San Francisco and Sacramento to Klamath Falls.